To the people of Mesoamerica, corn was a very sacred plant and this pre-Columbian Mexican soup was only consumed during special occasions. Ancient Mexicans believed that the combination of corn and meat was a religious communion of their sacred plant and humans: prisoners were killed in religious sacrifices and served as meat for the whole community. Today, we thankfully settle for pork. To become hominy, corn kernels are dried and soaked in an alkaline solution and goes through several chemical changes that turns them into nixtamal. (The ground version is made into dough for tortillas, tamales and arepas.) The word hominy is just a Powhatan word for maize. I love this soup for its heartiness, and yet its lime-cilantro-flavored broth is thin enough to be considered light. Feel free to skip the potatoes here if you want the hominy to be the star of the show. 1. In a large soup pot, bring the pork, garlic, onion and about 8 cups of water to a boil. Skim off the impurities that float to the top. Lower the fire down to a simmer. Cover and cook until the pork is very tender, about 2 hours. 2. Discard the garlic and onion. Stir in the potatoes, hominy, oregano and cayenne and season the broth with salt and pepper. Bring to a simmer and cook until potatoes are tender. 3. Turn off the heat and stir in some of the cilantro. 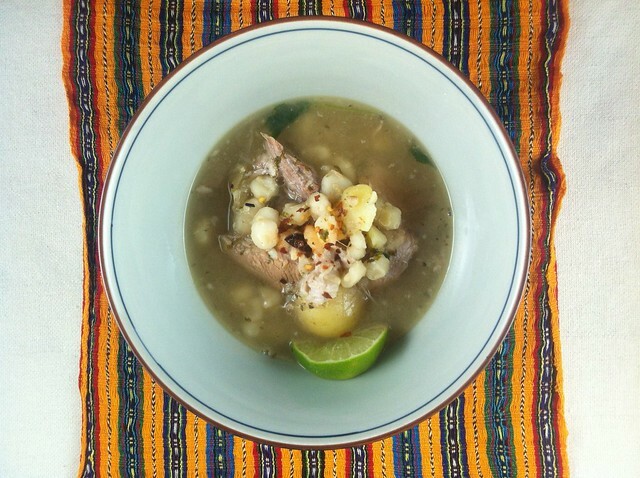 Serve and ladle the pozole into bowls with the remaining cilantro and lime wedges at the table.